MIN 4 NIGHTS on Holidays - that includes EASTER & Spring Break; OTHERWISE MINIMUM 3 NIGHTS. During Aug, Sep , Dec, Jan & Feb. 2 night min (excluding Holidays). 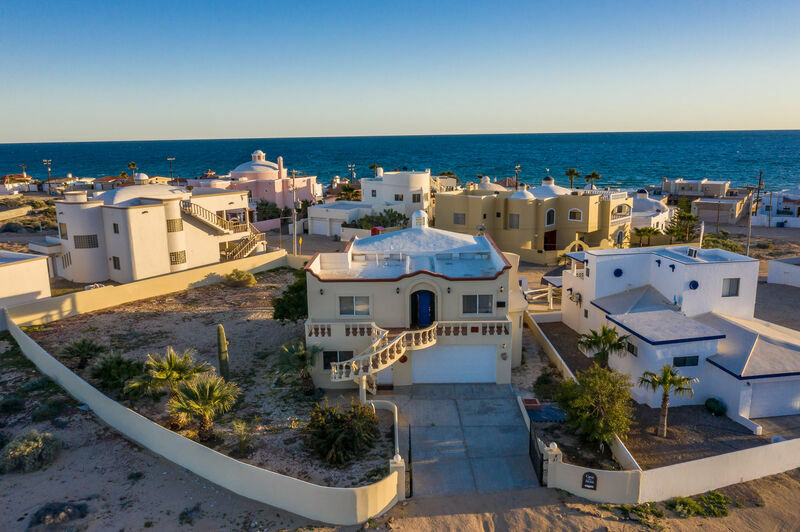 OWNER REQUESTS- NO SMOKING INSIDE, NO PETS, NO SPRING BREAKERS. .
Casa Arcos Del Mar is a beautiful 2-story home just a couple blocks into the Las Conchas beach community. This beautiful home is only 100 yards from the beach, with an ocean view from all of the windows that face that direction. The home has 5 bedrooms with 3 bathrooms and accommodations for up to 16 people. The home has it's own high speed internet & satellite TV. The UPSTAIRS GREAT ROOM has a brown sectional sofa with palm tree embroidered pillows, a coffee table, and an entertainment center that includes a new 55" TV, and a blu-ray player. The other side of the great room has a hand carved 10 foot dining room table with 8 chairs, and a china cabinet made by local artisans. There is another dining table/game table that seats 4. The spacious kitchen is fully loaded with all the appliances and you would need to cook for an army! Some of the items include two waffle irons, skillets, crock pots, a griddle, a food processor, mixer, juicer, blender and coffee maker. There is a black side by side refrigerator, a built-in microwave, and a stainless steel oven and glass top range. The kitchen also has a 10 foot built-in bar with 5 stools for more casual dining.TOTAL SEATING IS FOR 17 PEOPLE. The MASTER BEDROOM has a king size pillow top bed with a dark alder wood frame and decorative head & foot boards. Recently added a new TV & DVD player. The room has blue and gold printed bedding with two bed side tables, a mirrored dresser and windows on each side and a private patio. The room also has a large closet and built in drawers, and an attached bathroom with a walk in shower. The 2ND BEDROOM upstairs has a king size pillow top mattress with a beautiful cherry wood headboard and red silk floral and green plant accents printed on the bedding. The room has windows that look out to the city. The room has a bed side table, mirror, and a large closet with built in drawers and cupboards. The 2nd bathroom has a sink / vanity with a commode. DOWNSTAIRS there is the 3RD BEDROOM, containing two queen beds with pillow top mattresses. The room has a lighted bed side table with a dresser. There is a window with an ocean view, and a large closet with two sliding wood doors and 8 built in drawers. The 4TH BEDROOM has one queen and one king bed with pillow top mattresses that haved matching stripe bedding sets in maroon, green and gold. The room has windows that view the ocean, a large double door closet and a 8 built-in drawers. The 5TH BEDROOM has 2 queen beds with pillow top mattresses and with purple and green stripped bedding and a oi painting of the gorgeous sunset.. The last bathroom has a large vanity with a walk in shower and commode. The DOWNSTAIRS GREAT ROOM has a green sectional sofa and there is a POOL TABLE where you can challenge your friends or family to a friendly game. There are also wicker framed sofas and chairs bordering the pool table, and a full size futon. The room includes a media unit with a 50" TV and a Blu-ray player. The home also comes with HIGH SPEED INTERNET, cable television, and Air Conditioning. The back yard has plenty of outdoor seating with wonderful ocean views and a tiled outdoor shower. The patio also has a built in ceramic tiled bar with a tiled roof. This is paradise at its finest. You can grill up your food outside on the BBQ and watch the sunset over the Sea of Cortez. There is plenty of parking on the north and the beach side of the home. The home also has a new washer, dryer and 11 ceiling fans throughout. You and your family will be very pleased with the comfort and luxury and amenities in this Las Conchas beach home.